Review posted March 6, 2016. Orbit Books, New York, 2015. 359 pages. Wow! I suspected that I would appreciate the second book, Ancillary Sword, much more after reading the third book in the trilogy, and I was absolutely right. Yes, you need to read this trilogy in order. It's a unit, and everything comes together in this final book. 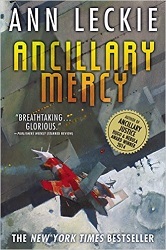 Book One, Ancillary Justice was about Breq, who was once the ship Justice of Toren and is now a lone ancillary, seeking revenge on the tyrant who destroyed most of her and the captain she loved. In the process of revenge-seeking, she starts a civil war, or at least makes obvious that a war is going on. In Book Two, Ancillary Sword, Breq is Fleet Captain of a new ship, Mercy of Kalr, with a crew of humans, but with access to everything the ship senses. She goes to a distant planet and deals with politics and intrigue on the planet and its orbiting space station, which has its own AI. In this third book, Ancillary Mercy, the part of the Lord of the Radch that hates Breq comes to the planet looking for her. Breq still wants revenge, and Breq is definitely in danger, and plot threads are woven in intricate ways. I can't say a lot about the plot, since I don't want to give anything away from the earlier books. By this time, I'd gotten used to everyone being referred to as "she." One thing I especially liked about this book was that even with the large cast of characters, there's growth in almost all of the characters. Some things Breq was doing as a matter of course in the last book, she's now questioning. And Breq's lieutenants face their own challenges, and even the station and the ship come up with some surprising character development. I can't wait for my son to read it so I can discuss it with him! (He gave me a copy of the first book for Christmas.) This book is mind-blowing and amazing.